This article is about the TV series. For the video game based on this TV series, see Captain Planet and the Planeteers (video game). Captain Planet and the Planeteers is an American animated environmentalist television program created by Ted Turner and Barbara Pyle. The series was produced by Turner Program Services and DiC Animation City and broadcast on TBS from September 15, 1990, to December 5, 1992. A sequel series, The New Adventures of Captain Planet, was produced by Hanna-Barbera Cartoons, Inc., distributed by Turner Program Services and broadcast from September 11, 1993, to May 11, 1996. Both series continue today in syndication. The program is a form of edutainment and advocates environmentalism and is famous for having a number of famous actors providing voices for the villains. The show spawned a franchise consisting of a charity, a Marvel comic book series, video games, and a TV crossover with OK K.O.! Let's Be Heroes. Pyle cites that the inspiration for the five Planeteers came from real people that she met during the show's pre-production in 1989. In a September 2012 interview with Barbara Pyle and Nick Boxer, it was stated that the Hope Island was located near the Bahamas. The original series was the second longest running US-cartoon of the 1990s, producing 113 episodes. It lasted for three seasons under the name Captain Planet and the Planeteers (produced by TBS Productions and DiC). The show's intro theme was composed by Tom Worrall. The ending theme (maintained by both DIC and Hanna-Barbera's versions) is considered one of the most memorable parts of the series due to its catchy main chorus and rock track ("Captain Planet, he's our hero, gonna take pollution down to zero"). Its lyrics were written by show producer Nick Boxer and is performed by Murray McFadden and Timothy Mulhollan. During the end credits, James Coburn, in character as Looten Plunder, utters the line "You'll pay for this, Captain Planet.". This is then followed by a rap from the voice actors of the Planeteers. It is akin to New Kids On The Block's "Step By Step". In 1993, the show saw a production company switch, changing the title to The New Adventures of Captain Planet (produced by Hanna-Barbera Cartoons, which was acquired by Turner in 1991). During this time, it aired as part of TBS' Sunday Morning In Front Of The TV block, alongside fellow H-B toons SWAT Kats: The Radical Squadron and 2 Stupid Dogs. This series revealed more of the past of each of the characters and expanded on it dramatically. The tone of these episodes was more mature than the initial series. The animation style was altered. The DiC seasons' synth-rock soundtrack was replaced by a large number of orchestral pieces, and while the end credits theme was retained, the ending sequence now showcased footage from the Hanna-Barbera episodes. A small number of cast changes occurred, affecting Gaia and some of the eco-villains. The opening narration was spoken by David Coburn (Captain Planet) rather than LeVar Burton (Kwame) and, in the final season, was replaced by a rap by Fred Schneider of The B-52's. The Captain Planet Foundation (CPF) was founded in 1991, when series producer Barbara Pyle negotiated a percentage of the show's merchandising revenue to empower young people. The concept allowed schools and organizations around the world to present their environmental projects to the Foundation and receive seed money to grow their ideas. In 2001, Time Warner decided to shut down the CPF due to a challenging merger with AOL. Laura Seydel and her husband Rutherford Seydel worked with Time Warner to orchestrate the transition of the corporate foundation to a public charity - the Captain Planet Foundation. In 2007, CPF acquired the rights to exhibit previous episodes of Captain Planet and the Planeteers online and on-air, thus "allowing this valuable resource to reach out and educate the children of today!" As of 2017[update], the organization's board is chaired by Laura Turner Seydel, daughter of Ted Turner; the board includes Barbara Pyle. Various episodes were constructed to touch on relevant themes to a modern audience. The episode titled "Mind Pollution" (1991) was notable for dealing with the issue of drug abuse. This was explained by the fact that the characters thought of drug addiction as "pollution of the mind". The episode revolved around an epidemic of a designer drug known as "Bliss" created by Verminous Skumm. It included a scene of Linka's cousin Boris jumping through a window and dying from a drug overdose. The episode titled "A Formula for Hate" (1992) was also unusual for the series in that it was the first episode in an American children's animated series to directly deal with the HIV/AIDS pandemic. In the episode, Skumm brainwashes a local community into thinking the virus can be spread through casual contact and thus causing people to hate and fear a young man, infected with HIV, named Todd Andrews (voiced by Neil Patrick Harris, with his mother voiced by Elizabeth Taylor). 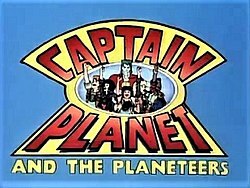 Every episode is followed up with at least one "Planeteer Alert" clip, often connected to the plot, where environmental-political and other social-political issues are discussed and how the viewer can contribute and be part of "the solution" rather than "the pollution". Gaia (voiced by Whoopi Goldberg in 1990–1992, Margot Kidder in 1993–1996), the spirit of the planet, sends five magic rings, four with the power to control an element of nature and one controlling the element of Heart, to five chosen youths across the globe. 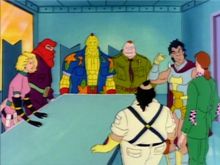 In situations that the Planeteers cannot resolve alone, they can combine their powers to summon the title superhero Captain Planet (voiced by David Coburn), a superhero who possesses all of their powers magnified. Once his work is done, Captain Planet returns to the planet, and leaves viewers with the message: "The power is yours!" Typically Planet only manifests to deal with the bigger crisis and then departs, but a few storylines have explored him existing beyond these moments, such as when he was summoned while Kwame and Ma-Ti were in space, with the result that the energy from their rings that created Planet could not return to its source, resulting in Planet being forced to operate on a human level, such as requiring a crowbar and handcuff keys to rescue the rest of the team. The Planeteers. Clockwise from top left: Gi, Kwame, Linka, Ma-Ti, and Wheeler. Kwame (voiced by LeVar Burton): Hailing from Ghana, Africa, Kwame possesses the power of Earth. The unofficial leader of the Planeteers. Wheeler (voiced by Joey Dedio): From New York, U.S.A, Wheeler controls the power of fire. Linka (voiced by Kath Soucie): From the Soviet Union (in later episodes stated as being from Eastern Europe after the Communist regime's collapse), Linka has the power of wind. Gi (voiced by Janice Kawaye): Hailing from Asia, Gi controls the power of water. Ma-Ti (voiced by Scott Menville): From the Amazon of Brazil Ma-Ti wields the power of heart. These five are dubbed the Planeteers and are tasked with helping defend the planet from environmental disasters and making efforts to educate humankind to keep others from happening. In the beginning of the episodes, Gaia uses her "Planet Vision" in the Crystal Chamber to discover where the most devastating destruction is occurring (in most episodes one or more of the Eco-Villains is behind it) and sends the Planeteers to help solve the problem. The Planeteers use transportation (usually a flying machine called a Geo-Cruiser) based on solar power to avoid causing pollution themselves. The Eco-Villains. Clockwise from left: Dr. Blight, Verminous Skumm, Duke Nukem, Hoggish Greedly, Zarm, Looten Plunder, and Sly Sludge. The Eco-Villains are a small group of antagonists who cause danger to the planet through pollution, deforestation, poaching, and other environmentally unsafe activities. They enjoy the destruction they cause to the planet and the harm they bring to obtain wealth, land, or power. They tend to work alone most of the time, although they're willing to work with one another when it suits their plans. Only in the two-part episode "Summit to Save Earth" did the entire ensemble of Eco-Villains work as a team, with Zarm as the leader. Each of these villains represents a specific way of thought that can cause ecological problems. Hoggish Greedly (voiced by Ed Asner) – A pig-like human who represents the dangers of overconsumption and greed, Hoggish is the first villain Captain Planet and the Planeteers encounter. In the episode "Smog Hog", it's revealed Hoggish has a son named Hoggish Greedly Jr. (Voiced by Jacob Doughty) who appears only once. In the episode "Hog Tide," it is revealed that he has a grandfather named Don Porkaloin (portrayed as a parody of Vito Corleone from The Godfather) who in the past was defeated by another group of Planeteers. Unlike Hoggish Greedly, Porkaloin became environmentally friendly as shown in the episode "The Ghost of Porkaloin Past". Rigger (voiced by John Ratzenberger) - Greedly's main henchman. He once claimed that the main reason he works for Greedly is because no one else would hire him. He does sometime question Greedly's orders and shows concern when Greedly's actions hurt the environment though it never has any effect on his boss, and Rigger, for the most part, remains loyal to Greedly. Rigger does all the leg-work while Greedly usually sits around and eats. Verminous Skumm (voiced by Jeff Goldblum in 1990, Maurice LaMarche in 1991–1995) – The second villain to appear on the series, he is a part human, part rat creature; he represents urban blight, disease, and drug abuse. Skumm can control rats and has his own personal helicopter called The Scum O'Copter. Skumm is responsible for the death of Linka's cousin Boris via drugs in the episode "Mind Pollution". Duke Nukem (voiced by Dean Stockwell in 1990–1992, Maurice LaMarche in 1993–1995) – A doctor who changed himself into a radioactive mutant who represents the misuse of nuclear power, and the third villain to appear. He is one of the few Eco-Villains, along with Zarm and Captain Pollution, able to battle Captain Planet one-on-one. Nukem generates radiation to fire off radioactive blasts from his hands and possesses X-Ray vision. Apogee temporarily renamed the eponymous character of the Duke Nukem computer game franchise to 'Duke Nukum' so as to avoid any possible trademark claims they could face from the producers of Captain Planet. The character was later found to be under no trademark and the games were restored to their original titles. Leadsuit (voiced by Frank Welker) - Duke Nukem's henchman, Leadsuit's name defines his appearance as he wears a full-bodied lead suit in order to withstand the radiation released by Duke Nukem’s body. He revealed that he works for Duke Nukem because when Nukem takes over the world, he'll get to be second in command. Leadsuit is timid, rarely arguing with Nukem (and always losing if he objects to anything). Leadsuit is afraid of the dark, and usually gives in at the slightest trouble. Doctor Blight (voiced by Meg Ryan in 1990-1991, Mary Kay Bergman in 1992–1996, Tessa Auberjonois in OK K.O.! Let's Be Heroes) – The fourth villain revealed, Dr. Blight is a mad scientist who represents the dangers of uncontrolled technology and unethical scientific experimentation. As a result of self-experimentation, the left half of her face is horribly scarred; this is usually hidden by her hair. In the episode "Hog Tide," it is revealed that Dr. Blight had a grandmother named Betty Blight who assisted Don Porkaloin in his plot. In the episode "Hollywaste", it is revealed that Dr. Blight has a sister named Bambi (voiced by Kath Soucie). Bambi calls Blight by her first name "Babs", a shortened form of "Barbara". MAL (voiced by David Rappaport 1990, Tim Curry 1991-1996) - Dr. Blight's artificially intelligent computer henchman. MAL has the ability to hack into other computer systems, take over them and reprogram them mainly to Dr. Blight's specifications. He is often the control and main power source of everything in Dr. Blight's labs as well as the vehicles she travels in. Looten Plunder (voiced by James Coburn in 1990–1992, Ed Gilbert in 1993–1996) – A wealthy poacher and crooked businessman who represents the evils of unethical business actions, his name is even a reference of the phrase "Loot and Plunder". He is the sixth villain to appear on Captain Planet in the seventh episode, "The Last of Her Kind". He is also shown to have a nephew named Robin Plunder as seen in the episode "Going Bats, Man". Argos Bleak (voiced by S. Scott Bullock) - Looten Plunder's main henchman and bodyguard, he also functions as a mercenary and carries out most of Plunder's dirty work. He seems to have a military background, as he is seen in many episodes flying helicopters or other aircraft, and is proficient in handling firearms. He even got his own episode "The Preditor", where he appeared without his boss to hunt down sharks. Sly Sludge (voiced by Martin Sheen in 1990–1992, Jim Cummings in 1993–1995) – An unscrupulous waste collector who represents laziness, ignorance and the dangers of apathy and short-term thinking. He's the last villain to be revealed. Ooze (voiced by Cam Clarke) - Sly Sludge's henchman. Zarm (voiced by Sting in 1990–1992, David Warner in 1993, Malcolm McDowell in 1994–1995) – A former spirit of the planet who left Gaia in search of other worlds and ended up laying other populous planets to ruin lacking Gaia to balance out his methods. He represents war and destruction. Even though Zarm does not have any henchmen of his own, he would often manipulate other people to do his bidding. He once united Hoggish Greedly, Looten Plunder, Sly Sludge, Duke Nukem, Verminous Skumm, and Dr. Blight under his leadership. Other times he recruits and manipulates others, even the Planeteers, to work for him. Zarm is the fifth Eco-Villain to appear in the series, having his first appearance in the sixth episode. Duke Nukem has a Super Radiation Ring (counterpart of Fire). Looten Plunder has a Deforestation Ring (counterpart of Earth). Hoggish Greedly and Sly Sludge have a Smog Ring (counterpart of Wind). Verminous Skumm has a Toxics Ring (counterpart of Water). Dr. Blight has a Hate Ring (counterpart of Heart). Each of the evil rings has malevolent faces on them, in contrast to the more element-themed Planeteer rings. Captain Pollution is weakened when he is in contact with pure elements such as clean water or sunlight, while he gains power from contact with pollutants, being able to absorb pollutant and emit radioactive rays (and is later shown to gain limitless power when in contact with pollutants after his resurrection). When he is summoned he says "By your polluting powers combined, I am Captain Pollution! Ha! Ha! Ha! Ha! Ha! Ha! ", and when he disappears, he declares "The polluting power is yours!" In his first appearance, he is sent by the Eco-villains to destroy the Planeteers but gets chased off by Commander Clash, and after a fight with Captain Planet, he returns to the evil rings causing them to explode. In the two-part episode "A Mine is a Terrible Thing to Waste", Captain Pollution is brought back to life by toxins of the 5 evil rings that seep into the planet. Captain Pollution is Captain Planet's polar opposite in personality as well as power. In contrast to Planet's generous and altruistic nature, Pollution is lazy, vengeful, and arrogant, seeing himself as a god and his creators as servants rather than partners. Captain Planet sums up the difference in their outlook during their first battle by taunting that the Planeteers have no boss - they are a team - and this is why Pollution will always lose. Captain Pollution resembles Captain Planet, but his skin is pale yellow and covered in brown lesions. His hair is red and styled in a Widow's peak and he has red eyes. His costume is the same color and style as Planet's, but the globe on his chest is torn in the middle. His voice has a California Valley twang to it. Captain Pollution is defeated twice by Captain Planet; first in Mission to Save Earth by being rammed through earth, lava, air and water, and then again in A Mine is a Terrible Thing to Waste by being tricked into going into an underground magma chamber. Like Captain Planet, Captain Pollution is voiced by David Coburn. Pyle and Boxer demanded that the series' merchandise be made sustainably; because of this, several of the companies producing Captain Planet-themed merchandise had to completely overhaul their means of production to manufacture recycled and recyclable products. As with many popular cartoons, Captain Planet had a line of action figures and vehicles. Released by Tiger Toys in 1990, the line ran for several years, long enough to tie into the New Adventures series. The toys were repackaged and sold by Grand Toys in Canada and Kenner throughout Europe. The toys were of average poseability, with the common five points – neck, shoulders, and hips. Finding a comprehensive list of what was released is difficult, since not all toys shown in the initial retailer catalog were even released. The collector's market is small, the toys being somewhat rare on eBay. The Captain Planet Foundation still sells a small number of them online, however. There may have also been further foreign variations of certain toys which may be even more difficult to catalog. Various toys from the New Adventures waves are not as likely to be well known. The five Planeteers, five Eco-Villains, Commander Clash, and several versions of Captain Planet, each with a different gimmick or paint scheme, were released, along with several vehicles. A toy ring with lights and sound and interchangeable lenses for the five elements was also released. Four small vehicles were also sold through a Burger King promotion. Marvel Comics published a short-lived comic series for 12 issues to tie into the show; however, the comics were a separate continuity. While not effectively part of the Marvel Universe, issue #4's cover was a parody of the cover to Fantastic Four issue #1. A video game based on the series was developed for the Nintendo Entertainment System by Mindscape called Captain Planet. The game, which involved a good deal of shooting, received negative reviews from game critics and thus a Sega Mega Drive (Genesis) version of the game was cancelled. A separate side-scrolling game was developed by Novalogic for the Mega Drive/Genesis, but only saw release in Europe and Australia. David Perry and Nick Bruty developed a ZX Spectrum and Amstrad CPC game using the license, a 3-level shoot 'em up. A game was also released in 1990 for the Commodore Amiga and Atari ST, written by Tony Crowther. This was a platform game and was briefly bundled with the Amiga 500 "Cartoon Classics" pack released in 1991. A Commodore 64 game was in development but never released. Tiger Toys, owners of the action figure license, also created an LCD hand-held game. Captain Planet appears as a playable character in the fighting game Cartoon Network: Punch Time Explosion for Nintendo 3DS, Wii, PS3, and Xbox 360. Several VHS tapes were released, usually with a single episode each. A DVD with four episodes and bonus features exists but was only available as part of a "Planeteer Pack" purchased from the Captain Planet Foundation. This promotional DVD contained the episodes "A River Ran Through It", "A Perfect World", "Gorillas Will Be Missed" and "The Big Clam Up" plus " Planeteers in Action", a short clip about Captain Planet Foundation. The "Planeteer Pack" special is no longer available. Shout! Factory released a DVD set of the complete first season in the U.S. on April 19, 2011. The DVD packaging is made of 100% recycled paper. But Seasons Two to Six have yet to be released on Complete Season DVD Sets. Madman Entertainment released the first season on July 6, 2016 and the complete collection on October 25, 2017 in Australia. As of March 25, 2017 it is available on iTunes for purchase. The whole series was made available on Amazon Instant Video. Multiple attempts have been made to create a film adaptation of the series. The first occurred in 1996 when Boxer and Pyle wrote a film adaptation of Captain Planet originally titled Planet. Five years later, Michael Reaves revised the concept as Dark Planet or Planet. The storyline was darker than the series, and set in a post-apocalyptic time period. However, the script was lost when Turner and Warner Bros. merged in 1996. The film reached the design stage before it was abandoned. Other attempts at a film version were made in 2007, 2011, and 2013. However none of these versions came to pass. In October 2016 it was reported that Paramount Pictures and Leonardo DiCaprio's Appian Way were attempting to develop a new movie and is in negotiations with Jono Matt and Glen Powell to write the script. On September 13, 2017, it was announced that Captain Planet would appear in a special crossover episode of the Cartoon Network series OK K.O.! Let's Be Heroes, with David Coburn reprising his role as Captain Planet and LeVar Burton reprising his role as Kwame. The heroes battled Dr. Blight (accompanied by a silent MAL). The episode, "The Power Is Yours", aired on October 9, 2017. ^ Pyle, Barbara. "Barbara Pyle, with Ted Turner and Robert Larkin III created the animated action series Captain Planet and the Planeteers". Barbara Pyle Productions. Retrieved January 12, 2012. ^ Jensen, Elizabeth (April 22, 2006). "An Aging Superhero Wins a Life Beyond Reruns". The New York Times. Retrieved 2010-03-13. ^ Szymanski, Michael (1990-02-03). "Captain Planet: Here He Comes to Save the Day". The Los Angeles Times. Retrieved 2010-08-24. ^ "We are Barbara Pyle and Nick Boxer, Co-creators and Exec. Producers of "Captain Planet and the Planeteers." AMA!". Interviewly. 15 September 2012. Archived from the original on 5 March 2015. Retrieved 15 March 2015. ^ "Captain Planet Foundation | Supporting Environmental Education". captainplanetfoundation.org. Retrieved 2017-04-18. ^ "Our Story". Captain Planet Foundation. Retrieved October 1, 2017. ^ "Board". Captain Planet Foundation. ^ "Terrifying moments in children's television". Rambling Beach Cat. Retrieved 11 May 2016. ^ Mendoza, N.F. (1992-11-21). "'Capt. Planet' Tackles the AIDS Crisis". The Los Angeles Times. Retrieved 2010-08-24. ^ "Children's Television Programming Report". Federal Communications Commission. 30 December 2006. Retrieved 14 March 2015. ^ "3D Realms Site: Duke Nukem I". 3drealms.com. 1991-07-01. Retrieved 2011-11-15. ^ "Captain Planet and the Planeteers on MobyGames". Retrieved 2008-08-24. ^ "Amiga Longplay Captain Planet and the Planeteers". YouTube. 2007-07-26. Retrieved 2016-08-17. ^ "Captain Planet Foundation". captainplanetfdn.org. Archived from the original on 17 May 2008. ^ "Welcome to Captain Planet Foundation's Co-Store". Web.archive.org. Archived from the original on 2008-02-17. Retrieved 2016-08-17. ^ "Captain Planet And The Planeteers: Season One". Shoutfactorystore.com. Archived from the original on 2012-04-05. Retrieved 2016-08-17. ^ "Captain Planet Season 1 - DVD". Madman.com.au. Retrieved 2016-08-17. ^ "Captain Planet Complete Collection - DVD". Madman.com.au. Retrieved 2017-10-25. ^ "Michael Reeves interview, in which he recalls the title as simply "Planet"". AnimationArtist.com. Retrieved 2007-02-08. ^ "Michael Reaves's website, listing the script as "Dark Planet"". Archived from the original on 2009-02-19. Retrieved 2008-04-20. ^ "Ted is currently in talks to create a possible movie version of the cartoon – wonder who will play Captain Planet?". Hoolywoodtoday.com. Archived from the original on 2007-12-15. Retrieved 2016-08-17. ^ Zeitchik, Steven (July 19, 2011). "Cartoon Network's 'Captain Planet' will be drawn into film". Los Angeles Times. Retrieved July 19, 2011. ^ Rosenfeld, Everett (22 July 2011). "With Hollywood's Powers Combined, a 'Captain Planet' Movie Will Hit Theaters". Time News Feed. Retrieved 22 July 2011. ^ "'Captain Planet and the Planeteers' Movie in the Works From Sony (Exclusive)". The Hollywood Reporter. ^ "Leonardo DiCaprio, Glen Powell Teaming for 'Captain Planet' Movie (Exclusive)". The Hollywood Reporter. Captain Planet at Don Markstein's Toonopedia. Archived from the original on April 9, 2012.